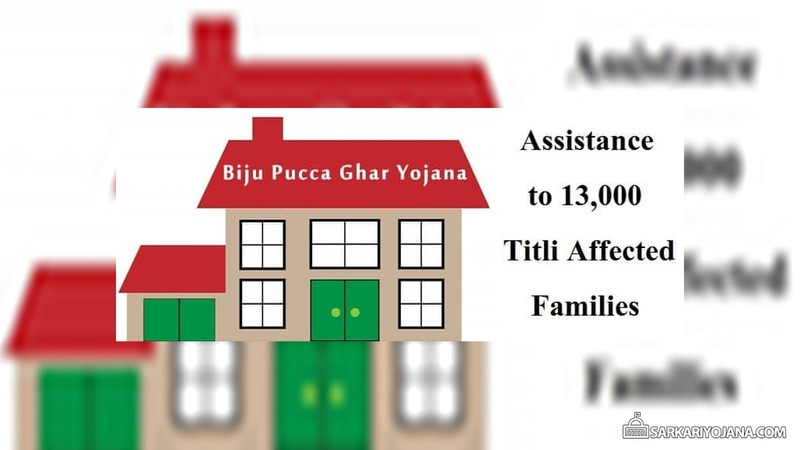 Odisha government has decided to provide financial assistance under Biju Pucca Ghar Yojana (BPGY) to 13,000 households affected by cyclone Titli in 11 districts of the state. CMO Odisha has given this information after a high level meeting presided over by the CM Naveen Patnaik. Chief minister has also asked the department to maintain transparency during the issue of work orders to affected families. The state govt. will allot these houses at an estimated cost of Rs. 176 crore. The state govt. would also take assistance of local traders and self help groups (SHGs) for preparation and supply of construction materials of houses. All the SHGs will get extra financial assistance from the state government. CM has given directions to issue all work orders on a specific date in all blocks to beneficiaries. This move will ensure that construction of new houses is completed in an expeditious manner. All those 13k families whose houses were completely destroyed by cyclone Titli will get this assistance for houses under Biju Pucca Ghar Yojana (BPGY). The state govt. has also decided to seek assistance of United Nations Development Programme (UNDP) to provide livelihood support to the affected persons. Even UNDP support would be required for providing training to masons and SHGs to prepare construction materials. Chief secretary AP Padhi also took a separate review on the progress of restoration works in the worst-hit Ganjam and Gajapati districts. Panchayati Raj department has given directions to issue work orders by end of this month so that beneficiaries would be able to start work from December 2018. Department must ensure that house construction work will be completed within 6 months from date of getting the work order. The state govt. will provide an assistance of Rs. 1 lakh to families from state disaster response fund. All those families whose houses have been totally damaged in the cyclone and subsequent floods will be given assistance. CM @Naveen_Odisha has directed to allot Biju Pucca Ghar to 13,000 #CycloneTitli affected families in 11 districts with a spending of ₹176 crore. For expeditious completion of the work and maintaining transparency, work orders to be submitted on a specified date at block level. The financial assistance as admissible under Biju Pucca Ghar Yojana (BPGY) will be provided to the beneficiaries. Collectors have been given advice to mobilize beneficiaries to utilize both the grants in the construction of their houses. Power supply has been restored to all affected consumers in Ganjam and Gajapati district. Gratuitous relief (GR) has already been distributed to all the affected families in both districts. Till date, around Rs. 249 crore GR has been distributed in Ganjam while Rs. 50.33 crore has been disbursed in Gajpati district. House building assistance of Rs. 191 crore and Rs. 8.27 crore has been released by the Odisha state government.